Still think it's performance art? Kanye West appears to be stumping for Donald Trump at this point especially now that shirts he designed debuted Saturday at Turning Point USA’s Young Black Leadership Summit (TPUSA), a meeting of young Black conservatives in Washington. The tees are encouraging Black people to exit — or “Blexit” – the Democratic Party. 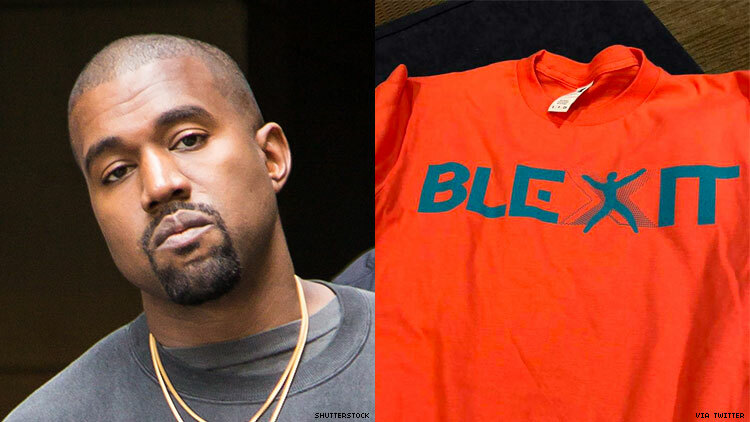 “Blexit is a renaissance and I am blessed to say that this logo, these colors, were created by my dear friend and fellow superhero Kanye West,” said TPUSA’s Communications Director Candace Owens. The tees are just the lastest in a string of events and incidences of West backing the president that occurred this month including his rambling meeting with Trump in the Oval office a few weeks ago and his post-appearance rant on SNL that engendered this hysterical take down by SNL's Pete Davidson. “The Blexit movement will spend 2019 holding rallies in every major city in America that the Democrats have destroyed,” Owens said.